How did you change the world in the last 48 hours? Or do you believe that you have to change the world in a big way otherwise it’s not worth even trying? I had a truly inspirational day yesterday when I joined hundreds of thousands of other people cheering on the runners at the London Marathon. I am not often lost for words, but yesterday I was really blown away by my experience. So I will try and describe the day as best as I can. Call them mad, call them crazy but you really have to admire anyone who is willing to put so much effort into pounding the streets of London for just over 26 miles. And yesterday there were over 35,000 “crazy ones” who spent up to 8 hours and ran/walked/pushed/staggered their way around the course. What was also amazing was the costumes these crazy ones wore! Check out some images of the crazy ones on my Facebook page. It was a record year with over 35,000 runners completing the course and lots of world records broken for zany costumes and other fun things. The London Marathon has now become the largest single fund-raising event in the world with millions raised ever year. The slogan used by the main sponsor Virgin summer it up – “Every penny raised, everyone’s better off”. What is equally impressive and inspiring is the sheer herculean effort, commitment and organisation it takes to put together an event of this scale. For a few hours, one of the biggest and busiest cities in the world is brought to a complete standstill – just think of all the logistical and organisational requirements. At the same time, the authorities have to look after the security and wellbeing of people, with over 2 million spectators in a tiny area. 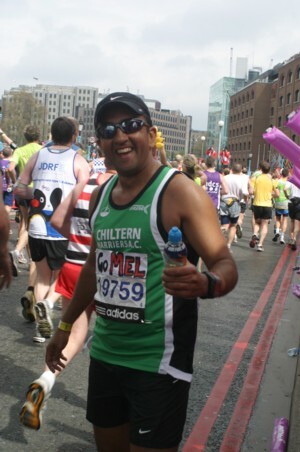 This year I was a spectator, cheering on the runners as well as supporting WellChild, the charity I ran for a year ago. Yesterday, I wished I had been running too – and I am really inspired to take part in next year’s event. As I watched all these runners run pass me in their zany costumes, I was in awe of what it takes for so many people to come together in such a momentous way. 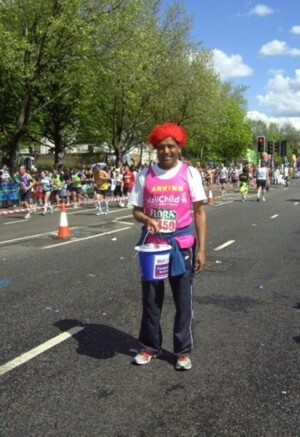 The runners came in all sorts of shapes, sizes and colours, and represented every group of people and culture from around the world. It was a sea of humanity united in a common cause of contribution, challenge, fun and perhaps even madness. One of my friends, Phil Bolton, ran on Sunday and you can read his enthralling account of how to be an everyday superhero. Having done it all myself a year ago and though I walked all the way, I know just what it takes to take part and complete a marathon. 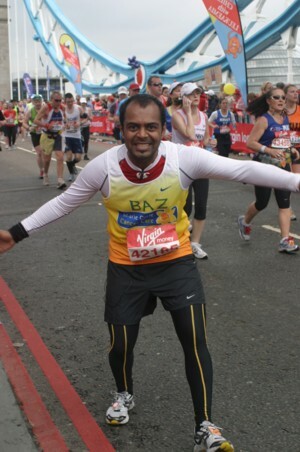 I wrote about this a year ago – and do check out my 10 life lessons from running the London Marathon. Most runners raise money for their chosen cause and at the end of the day, millions will be raised for all sorts of worthy causes and charities, small and large. What was clear was an overriding sense of unity and togetherness towards a greater cause, a higher and noble goal. People were incredible in their encouragement and appreciation of all the effort put in by the runners. I really love attending such events and seeing people at their best and most inspiring. It just shows what’s possible if and when we put our minds to it. 1. The human spirit is incredibly powerful – we can get through almost any challenge facing us. 2. We are far more able and resourceful than we give ourselves credit for – we can do almost anything once we put our mind to it. 3. We all want to contribute and give back to others in our own way – we are born with a desire to make a difference to others. Change the world, don’t wait for the world to change. The most important thing is this – some of you will be glad to know that you don’t have to run a marathon to make a difference and make the world a better way. Start in your own small way, in whatever way works for you. And don’t let your fears hold you back either. The rewards for changing the world come in their own way – just doing so is a worthy reward in itself. So how will you change the world in your own way? Start with something small – start wherever you are now and do something today. At the end of the day, you will get such a kick out of it doing so. Take up whatever cause appeals to you – at the end of the day, it does make a difference to all of us. Very inspirational post. I don’t think I am in shape to run a marathon soon, but it was inspiring to hear about your experience and I am in complete agreement with your 3 insights and what you learned. It really is all about contributing and doing something in your own way. Thanks for the reminder and the inspiration. Congratulations on running the marathon…that is by all means a big accomplishment. There are various programs which take you from a novice to a marathon finisher within 3 months. As you say it’s all about contributing and doing something in our own little way. (Just a point of clarification – I didn’t actually run the London marathon this year – it was last year). Well, I’m yet to run a marathon, but I definitely respect those that do! However, I have participated in some mass events like marathons, and the other learning I’d add to your list is that we are more than the sum of our parts. It just seems that the more people gathered together for a particular outcome, the more powerful they become simply by being part of a group. It’s a very moving experience, and makes you realise that we can make a difference! Topi, excellent contribution – we are certainly more than the sum of our parts. Somehow the energy that we create when we come together as a group with a common aim is just incredible. We sure can make a difference! Wonderful post . If everyone chooses to do their little ‘somethings’ consistently we’ll have a better , happier world. Great post, I will change the world in my own way, by making an effort to truly make a difference in people’s lives by my creative outlets such as writing. It is great to see you changng the world through this run! Great stuff here. Baker, everyone can make a difference in their own way – and it doesn’t have to be so publicly as running a marathon. I love the focus of your site which is always on making the world a better place. What could be more significant than this? This past weekend I conducted disability evaluations (mental health but many people have medical challenges too). Although it makes for a very long day, so often I walk away feeling a sense of satisfaction when I can sit with someone in their pain, hear them, and truly be with them. The system isn’t set-up for that as they are “quickie” evaluations. To me, though, it is the core of what I love to do with people and I sometimes will take 1 1/2 hours. My hope is that by helping just a little to restore someone’s faith in life and people I am making a small contribution. Your point that people contribute in very different ways really resonated with me. I am not one who frequently goes to huge events, although they are wonderful. My way is a bit different, yet as I say, I hope that I am able to provide a benefit in my own way. Lauren, it feels great to have finally found a consistent focus and driver for my writing – as you say what can be more significant than wanting to make the world a better place. Thanks for sharing a bit more about what you do and how you contribute. Your way of contribution is just as valid and important as anyone else’s, no matter how voluble or quiet. The greatest gift you can give another human being is to truly listen to them and be present for them. You didn’t even need to say anything and neither do they. When you give someone that level of attention and love, they will get it. Making a difference to someone can be easy as just being yourself. The power of the human spirit is unreal Arvind! One of my favorite things to do is test it…personally. I recently signed up for a 31 mile trail run in Lake Tahoe, California. I just got into barefoot running with my Vibram’s and my goal is to do it in those. The farthest I’ve ever run is 15 miles. I’m excited and know it’s possible! The biggest issue is tuning out those who tell you it’s not. There are a lot of them. And yes, do not listen to those who tell you it’s not possible. The power of the human spirit is truly awesome – never let anyone tell you that you can’t do something. Sound like it was good, fun event that helped people with fitness and helped charity at same time. I like all dressing up part, make event little more fun! Is the person in red wig you? or my eyes need new glasses? Zengirl – the person in the red wig is indeed me! Sunday was an amazing and memorable day – I highly recommend everyone to support the runners next year. Arvind, I enjoyed this post very much. It reminds me of my years watching the Boston Marathon, run along the Charles River. It’s held on Patriot’s Day (around April 18) after a reenactment of the Battles of Lexington and Concord, fought against a certain colonial power. The marathon, like the London marathon, is a terrific spectacle, especially as participants struggle up a hill about 20 miles into the race. Some never make it past the aptly-named Heartbreak Hill, while others continue to cross the finish line. What a great accomplishment! Madeleine, thanks for sharing about the Boston Marathon which sounds like fun – until you get to the hill after 20 miles! .-= Arvind Devalia´s last blog ..How You Too Can Be An Energiser Bunny for 24 Hours a Day =-. 2) Not all journeys are easy but if you want to make a difference you’ll see it through. You’ve got to love those crazy risk takers, those lovers of helping others, marathon winners one and all. It’s not a race, it’s like life – it’s the taking part! .-= John Sherry´s last blog ..5 Cracking Ideas For Cracking The Tough Times =-. As you say, not all journeys are easy – but what a fun way of living your life!